Responsive and lightweight RapidWeaver toolbox. Is there a better alternative to Pure? Is Pure really the best app in HTML category? Will Pure work good on macOS 10.13.4? 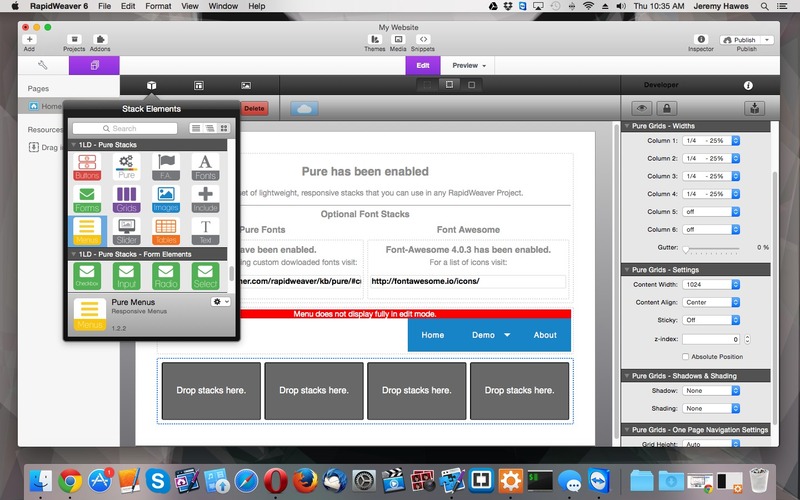 Pure is your complete, responsive, and lightweight toolbox for RapidWeaver. 11 multi-functional Stacks, 6 template Stacks, and 1 custom-ready theme all bundled together in one package. It's everything you need to efficiently create your own custom websites! Navigate with ease. Unhampered with the extra css, js, or image files, your site will operate with light load times without tons of unnecessary files. Pure Stacks uses a minified CSS file carrying only about 6KB, giving you what you need without the fluff. All the stacks you need to create your website are included. Pure needs a review. Be the first to review this app and get the discussion started! Pure needs a rating. Be the first to rate this app and get the discussion started! All the stacks you need to create your website are included. But if you wanted more, Pure will also work in any other theme that accepts Stacks. Cut down your time from building from scratch and assemble your entire website from RapidWeaver Stacks. Your website will look great on any screen size. All of the included stacks are built to be responsive. In addition, every design/function you see displayed on this page has been made with Pure Themes and Stacks only. To make building and learning simple, we provide free RapidWeaver Sandwich files for download. These files are created with Pure Stacks and can be used as starting points for your designs. We will be releasing more project files in the future. Using Stacks new feature we are also able to supply you with 6 Template Stacks. These templates can be dragged/dropped to quickly set up a footer, slider, content section, or sticky navigation menu. Due to the powerful flexibility and versatility of Pure, creating uniquely designed sites is simple, fun, and extremely fast. Whether you're using Pure for your own sites or to wow a client, each build can be limitlessly different.